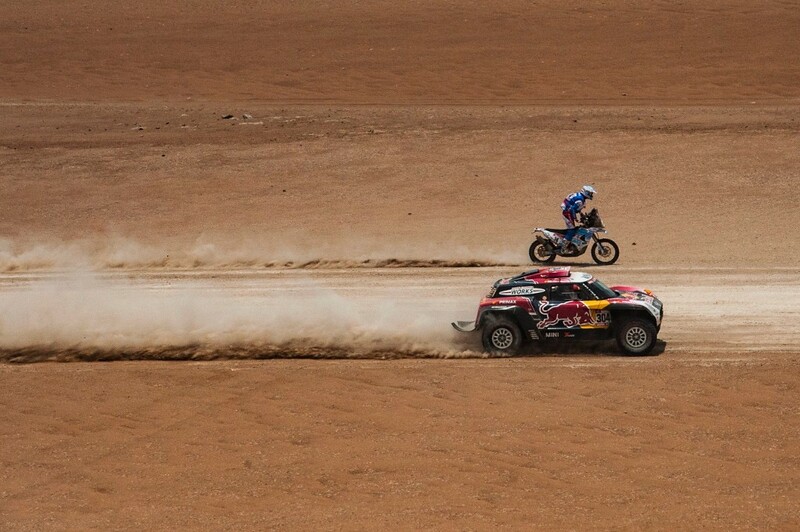 Rally Dakar is without a doubt the biggest, toughest, and most monumental event in motorsport. Just one day of the event is an epic undertaking: racing across open terrain, navigating with an old-fashioned roadbook and odometer, and the need to know when to risk it all and when to hold back. 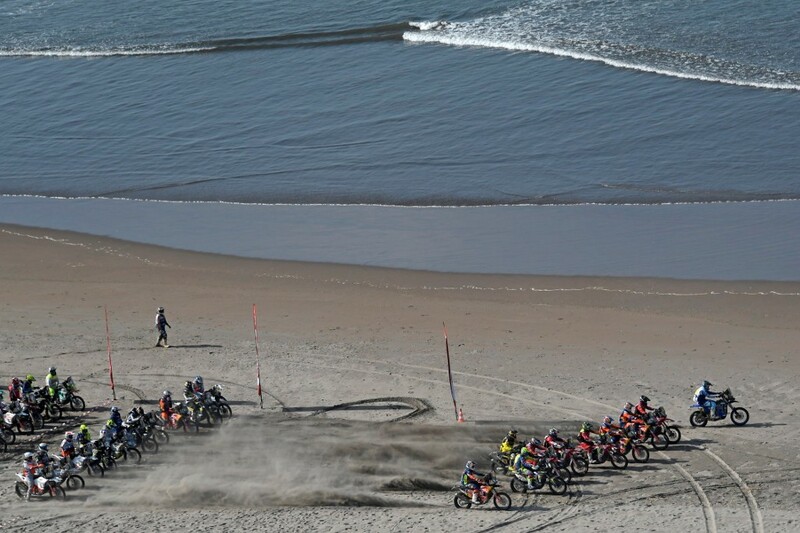 This year’s event is already more than half over, with the mid-point rest day gone and competitors heading back into the Peruvian dunes. Now is a great time to recap the first half, and I’ll try my luck at making some predictions. I’ll come back and wrap things up after the rally ends too, and add some of the important rumors about the rally’s future. Although cars and bikes run in their own classes, they need to find a way to safely share the course together each day. Photo: ©ASO; Charly Lopez. 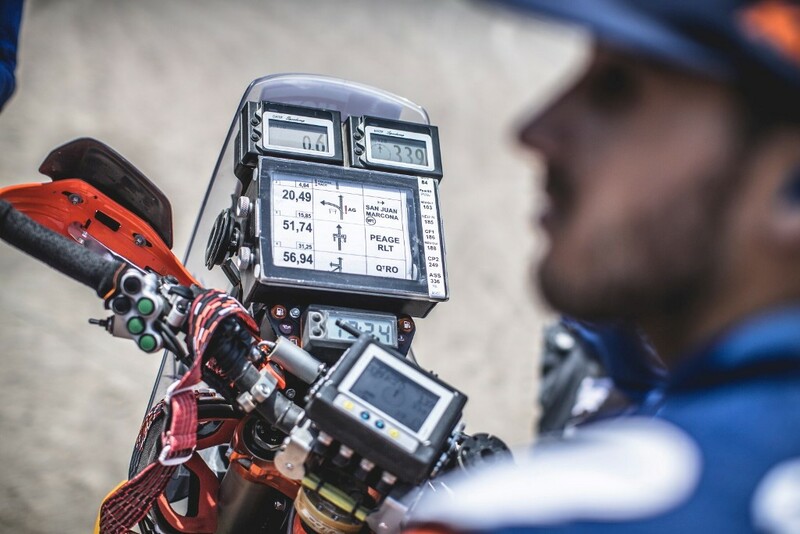 Dakar officials have already made an excellent recap video (see below) but it has to pack so much information into 6 ½ minutes that your head will be spinning trying to keep up. Let me first break down the main stories going into the rally, then we can look at how those stories have played out so far. The heart of this event is the heart it takes to push yourself beyond what you thought capable, so the people finishing in 100th place are as interesting as those who place 1st. Of the 10 stages in this year’s rally, let’s now cover the first five that happened before the official rest day. The main story for the past several years is Honda’s continued attempt to defeat KTM and their unstoppable winning streak (they’ve won the bikes category every year since 2001). Both teams have a list of at least five top riders with a chance at winning, plus over a dozen more riders that are either direct factory riders or are supported by the factory team. This is done because penalties—up to disqualification—can be handed out for receiving outside support. 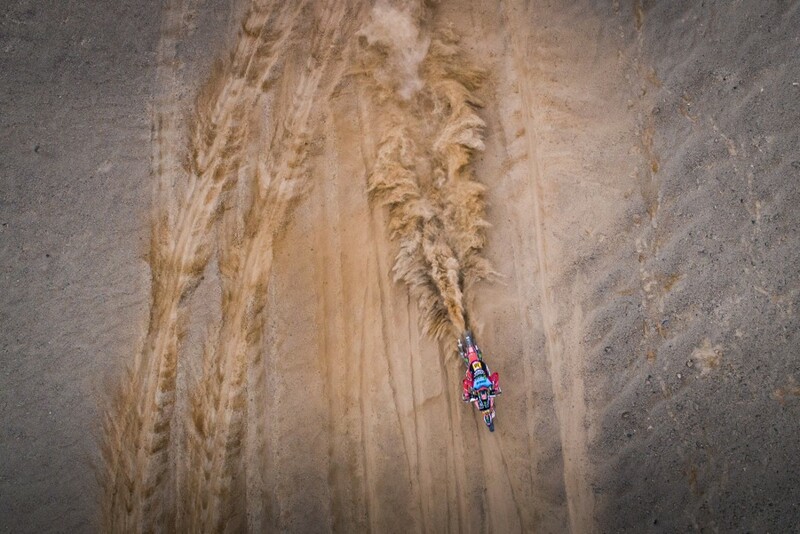 If trouble happens on the trail, teammates stop to help each other. Factory supported riders are expected to hand over their machine (or any part of it) to get a top-level teammate back in the race. 1As a factory rider, KTM’s Laia Sanz can expect other KTM riders to stop and give her parts or other assitance on the track, but if a faster teammate needs the same thing, she is also expected to stop and render aid. 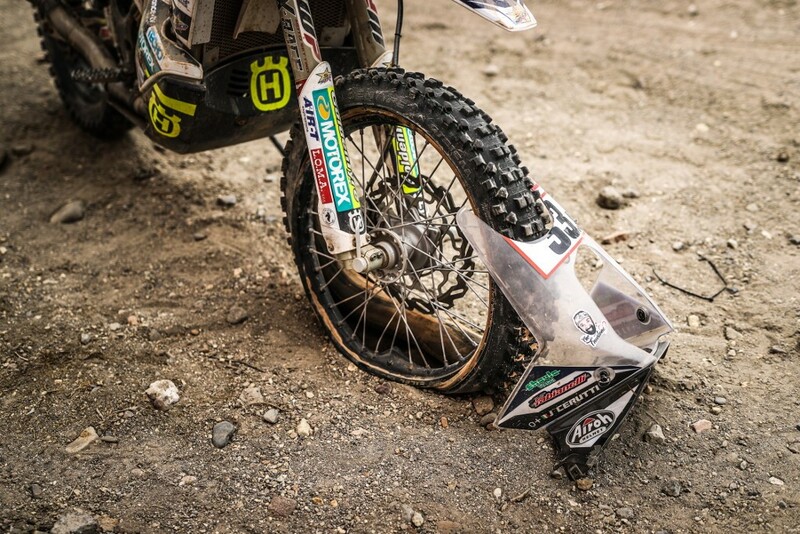 This is the only way to ensure your team survives Dakar. Photo: Red Bull Content Pool. Aside from these two factories, Yamaha has the distinction of running their factory effort with bikes built directly out of their performance catalog: no one-off, unobtainable race parts here. KTM’s sibling company Husqvarna also heads a small but determined effort that is capable of wining stages, but has never made the final podium. 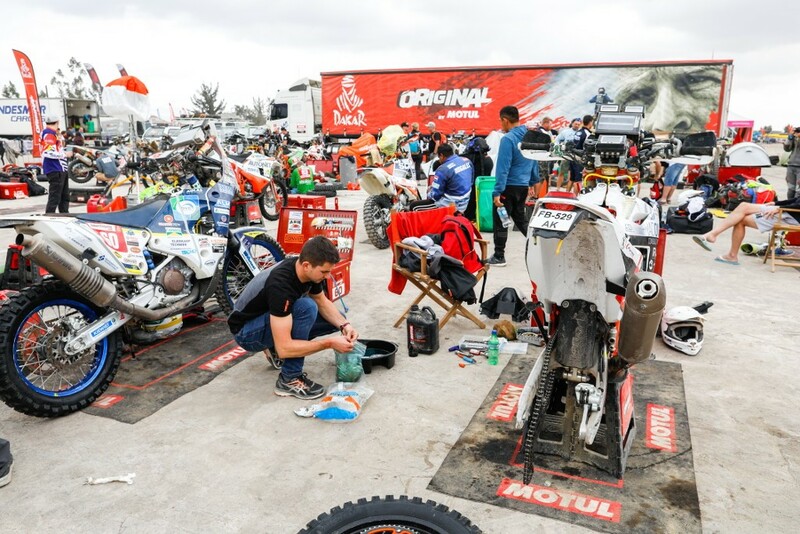 Riders in the Malle Moto (now called Originals by Motul) class must do it all, from navigating to maintenance to updating their sponsors and social media accounts. Photo: © ASO; A. Vincent. 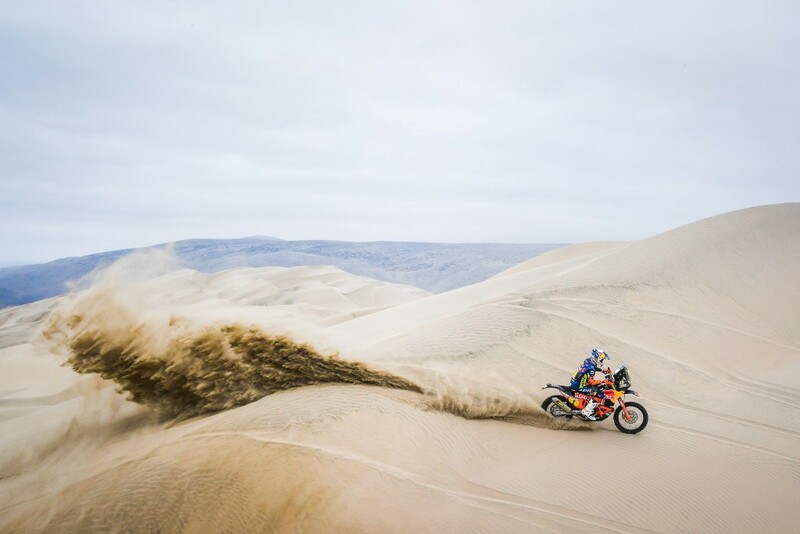 Everyone, including his own KTM teammates, is looking to beat Austrian Mattias Walkner, who won last year’s Dakar. Remember though, there are dozens of notable stories in the Dakar, and looking at only the front of field misses the point. There are 167 riders entered in the bikes and quads classes, most of them privateers who spent at least the last year (and a small fortune) just trying to get to the startline, where the real challenge begins. I’ll highlight a few of them further down. The factory riders get all the attention, but aside from them there are fights for top rookie, fastest female (which KTM’s Laia Sanz refuses to relinquish after nine consecutive Dakars), and the Originals by Motul class, previously called Malle Moto. This class requires riders to do all work themselves. 34 riders are entered in this class for 2019. They are given a small container for tools, spares, tent, and clothes, which is carried by truck to each bivouac as the rally progresses. Originals riders can help each other, but no other person can do so much as hand you a tool or hold a flashlight for you while you work. The early days of Dakar so no factory teams, so everyone was their own mechanic. The Originals class keeps this vibe alive with their section of the pits feeling more family-like. Photo: ©ASO; F. Le Floc’h. You’re expected to do the riding, wrenching, navigation, pre-race prep, and still find time for food and sleep. This year it has been hard to get information on the class, but as usual the fastest Originals rider is hovering just outside the top-30. It’s absolute ironman stuff from these folks. 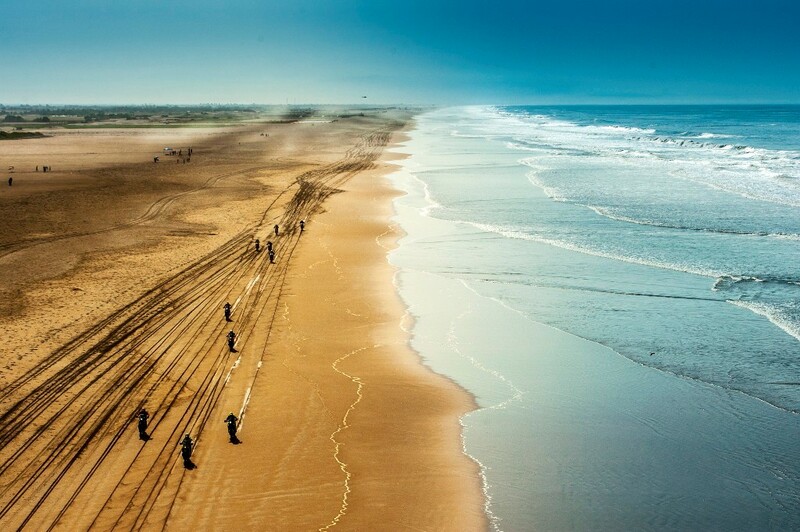 Every Dakar is made up of liaison stages and special stages. Riders are not timed on liaison sections but are penalized if they take too long and miss the designated start time of the special stage. Special stages are the actual “racing” portion where competitors are being timed. In all it’s over 10,000km of riding. A helluva lot of that is in the massive sand dunes of Peru. Dune sections alternate between flat, high speed runs and vicious climbs over razorback ridges. Rolling dunes are a good way to misjudge and fall into a hole. Either way it taxes the bike, the body, and the mind. Photo: ©ASO; C. Lopez. Stage 01 always has a short special stage (only 84km this year) so there isn’t a lot to talk about. Usually riders avoid mistakes that could cost them time on Day 01, but Honda’s Joan Barreda Bort (#5) rode a bit like it was a motocross race, taking the stage win. 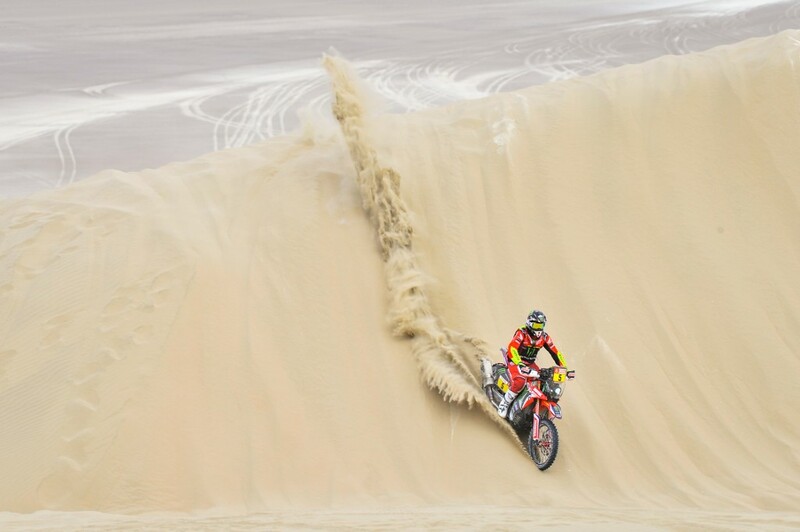 Barreda made short work of the dunes early on, event when he was the first bike out on Stage 02. Photo: ©ASO. 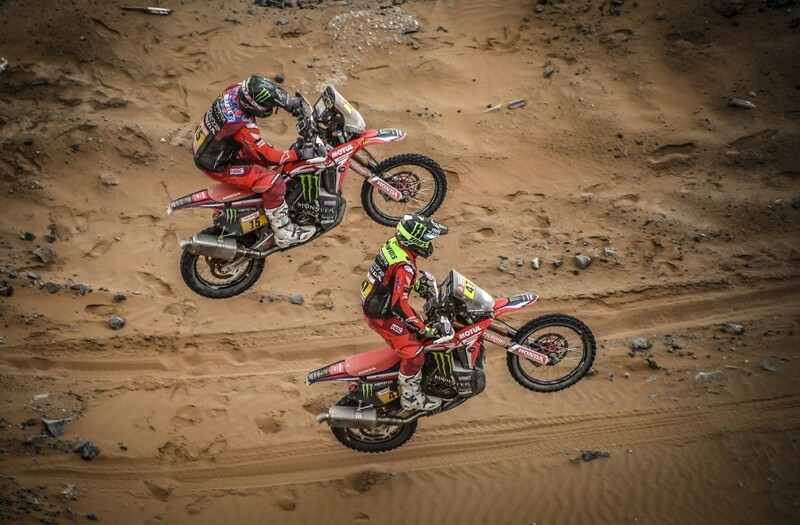 You start each day in the finishing order of the previous day though, which put Barreda out front on Day 02, with successive riders able to follow his tire tracks, aiding in navigation and avoiding hidden dangers in the shifting dunes. Surprisingly, Barreda still managed 3rd place; good enough to hold the overall lead. One of his teammates, American Ricky Brabec (#15), led the entire stage before getting dethroned by last year’s winner, KTM’s Mattias Walkner (#1). The top-five riders are still within 4 ½ minutes of each other at this point. Stage 03 was a nightmare for everyone. Coastal fog socked in the course, which was already almost featureless. With cars, trucks, and motorcylces lost on the course and going in circles, the chance of being run over by another competitor was very real. But the real threat was losing time. Both Ricky Brabec and Mattias Walkner lost over 20 minutes trying to find their way in the soup, totally shuffling the order. Fog usually stops the rally because helicopters cannot fly to injured racers. Stage 03 caught even the organizers by surprise, but as racers came down from altitude it cleared up. Photo: ©ASO; F. Le Floc’h. 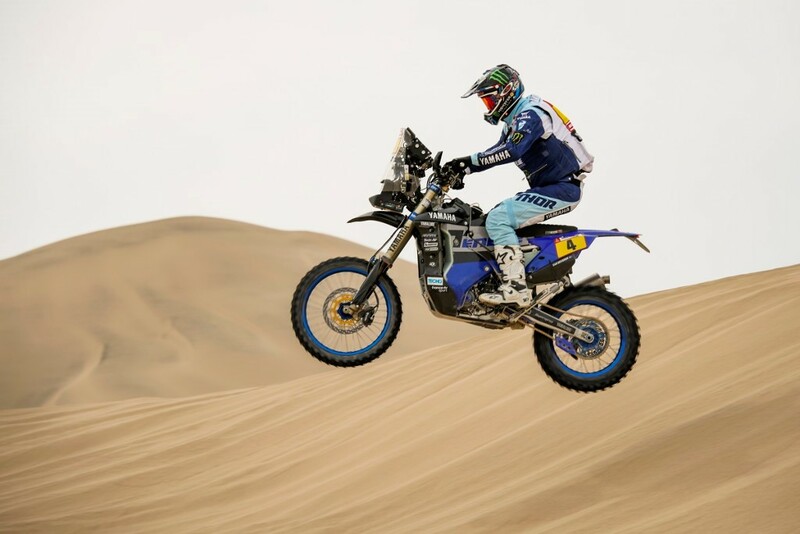 It was Yamaha’s Xavier de Soultrait (#18) who found the coastline first and won the stage, but Husqvarna’s Pablo Quintanilla moved into the overall lead. 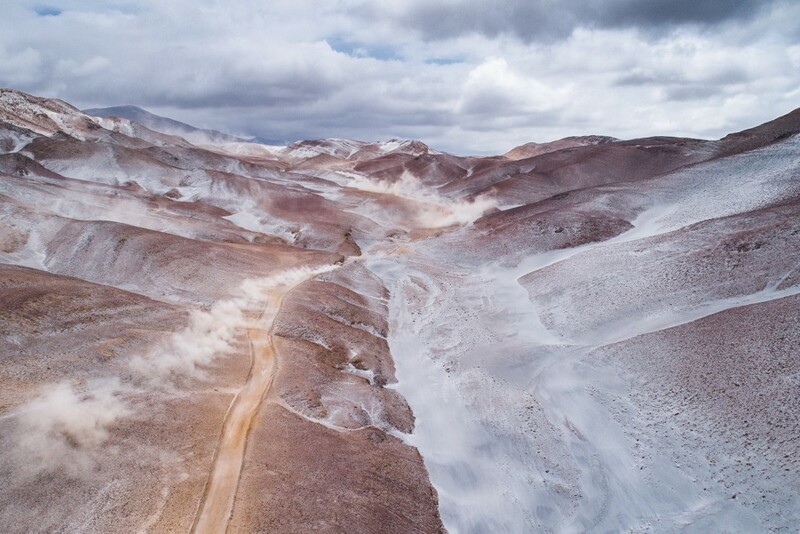 For those keeping track, that’s three stages with three different brands and three different riders taking the win; Dakar is impossible to predict. 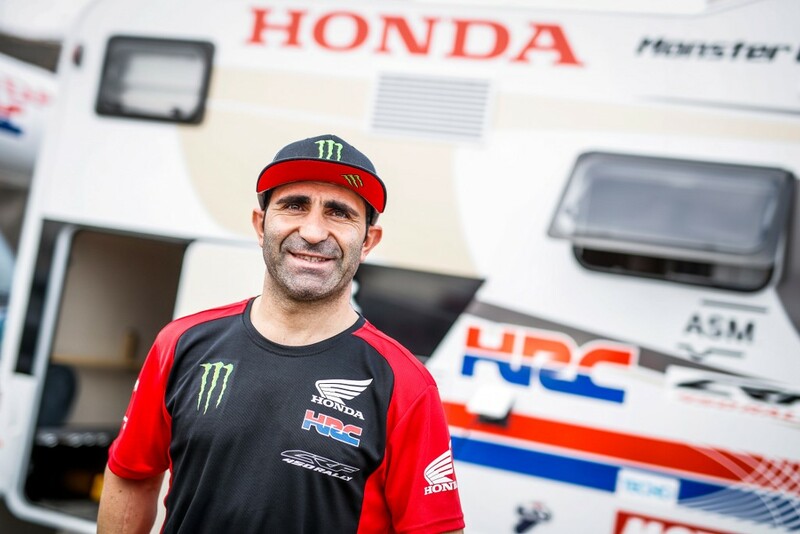 A perfect example is the loss of race leader Joan Barreda Bort. He fell into a ravine while stumbling through the fog. 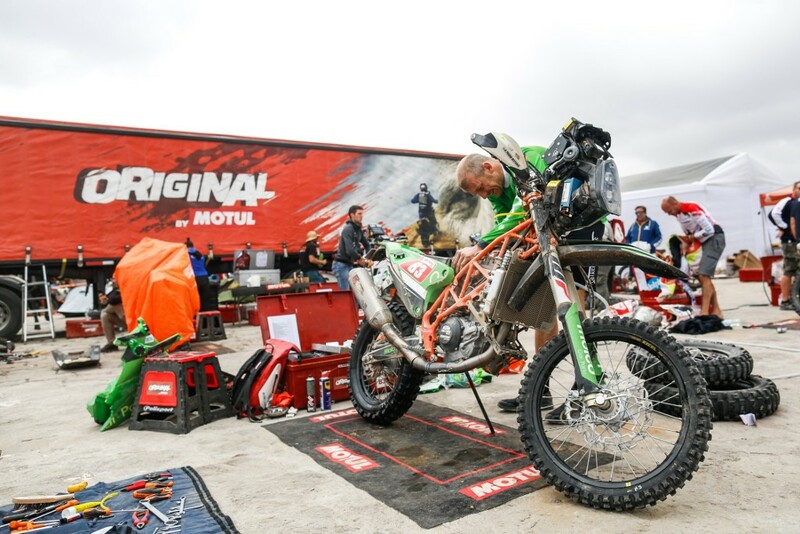 After several hours of riding around looking for a way out, he had to call for a helicopter to extricate him and his machine, ending his Dakar. You can’t make this stuff up. Stage 04 and 05 are a marathon stage. This means only the rider can work on their machine over the course of both days. The bikes are impounded overnight to prevent mechanics from touching them. If you damage something during stage 04, you either fix it yourself (changing anything but tires incurs a huge time penalty) or you deal with the consequences to the end of stage 05 (which is fortunately followed by a rest day). The Marathon stage is not the place to have a problem. Even cleaning your air filter is forbidden without a huge time penalty. Photo: ©ASO; A. Vincent. Ricky Brabec didn’t seem too worried. Remember how he lost all that time in the fog? Well he didn’t forget it either and rode a mistake-free stage to not only win the day but also retake the overall lead! This is even more surprising considering the terrain, which was a mix of rocky ravines, rock-strewn sand washes, and the first fesh fesh of the rally. If you’re wondering, fesh fesh is an African word for the talcum-powder-like dust that is impossible to gauge the depth of. None of that is terrain you want to try to make up time on, but Brabec did it anyway, keeping Honda’s dream alive. Quintanilla lost 20 minutes on the stage and finished 14th, but still held onto 2nd overall. Fesh fesh is a sand with the consistency of talcum powder. It can be inches deep or over a foot deep. Photo: ©ASO; F. Le Floc’h. KTM fought back but suffered two big setbacks. 2016 winner Toby Price (#3) took 3rd in the stage but injured his wrist in a heavy hit on the stage. This injury was already present before the rally started but the pain increased drastically during the 4th stage. 2nd on the stage was Mattias Walkner, who came in with a bad ankle injury he received on course due to an awkward landing. For stage 05 the bikes were sent off from the beach in packs of 10 at five-minute intervals. The long drag race beside the surf made for some great helicopter shots, but the real action was during the run to waypoint 3 when Honda’s Paulo Goncalves had a high-speed get-off, taking him out of the race with neck and head injuries (not life threatening). In another only-in-Dakar moment, Ricky Brabec jumped back into the overall lead despite finishing 13th on the stage. This was due to a combination of events, but can be summed up as his rivals having worse luck than him. 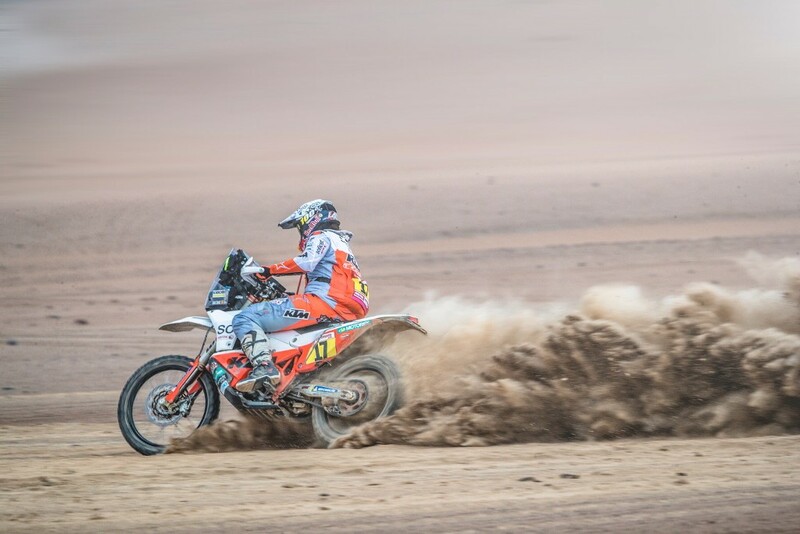 For example, KTM’s Mattias Walkner wasn’t showing any signs of his ankle injury while coming in 3rd, but a 3-minute penalty for speeding in a control zone dropped him back to 11th place for the stage and 7th overall. KTM’s Sam Sunderland (#14) lost 11-minutes when he stopped to help the injured Goncalves. As usual though, he was given the time back at the end which made him the stage winner. This was enough to bump Sunderland (the 2016 Dakar winner) to 2nd overall, only 59-seconds shy of Brabec. Yamaha often gets forgetten amidst the KTM vs. Honda rilvalry, but they are the only factory running a bike using only kit parts you or I can buy from their catalog. Here, France’s Adrien van Beveren puts it to good use. Photo: © ASO; F. Gooden. So we got half-way through this crazy race and the top three are separated by only 2m 52s. 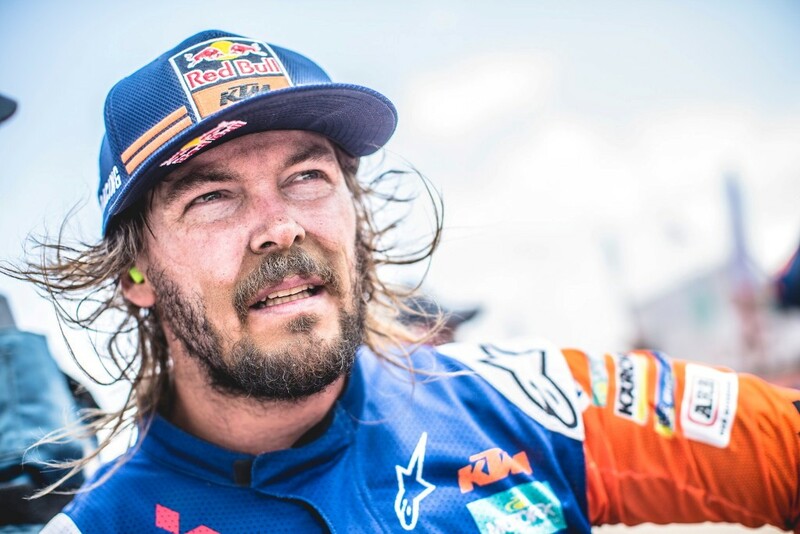 American Ricky Brabec carries the banner for Honda with the hopes he can earn them—and himself—a first Dakar Rally win. 2016’s winner Sam Sunderland sits less than a minute behind and hopes to take an 18th consecutive win for KTM. Husqvarna’s Pablo Quintanilla sits 3rd and has been playing a take-no-risks strategy to perfection so far. With five more days of action though it’s impossible to predict the outcome. However, since there is no penalty if I’m wrong, I’ll put my bet on Sam Sunderland. He has avoided big mistakes and is a previous winner. He can lead from the front but is also good at playing follow-the-leader, waiting for a time to strike. Dakar rewards guile and cunning more than it rewards wide-open-throttle attacks on the record books. 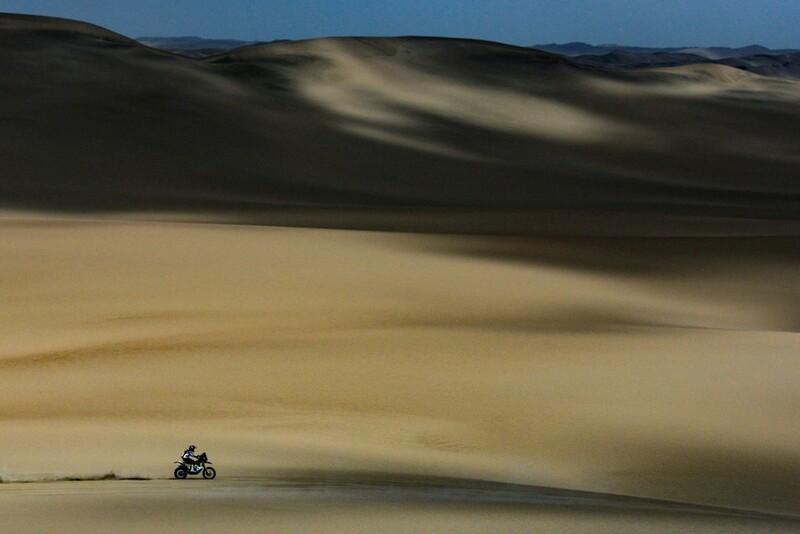 The dunes can be a lonely place, but Mattias Walkner seems quite at home ther on his KTM. © Red Bull Content Pool. At this point though Honda has to be hungry. They’ve been denied repeatedly, but they are also down to just two riders with a shot at victory. 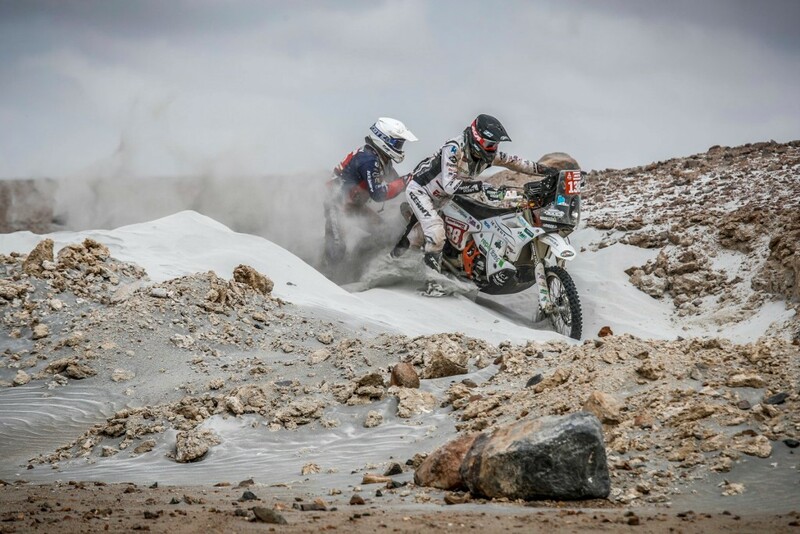 Kevin Benavides is over 9-minutes down in 6th and while Ricky Brabec leads, he is competing in only his 3rd Dakar, with only a single stage win (before 2019) and a best result of 9th . 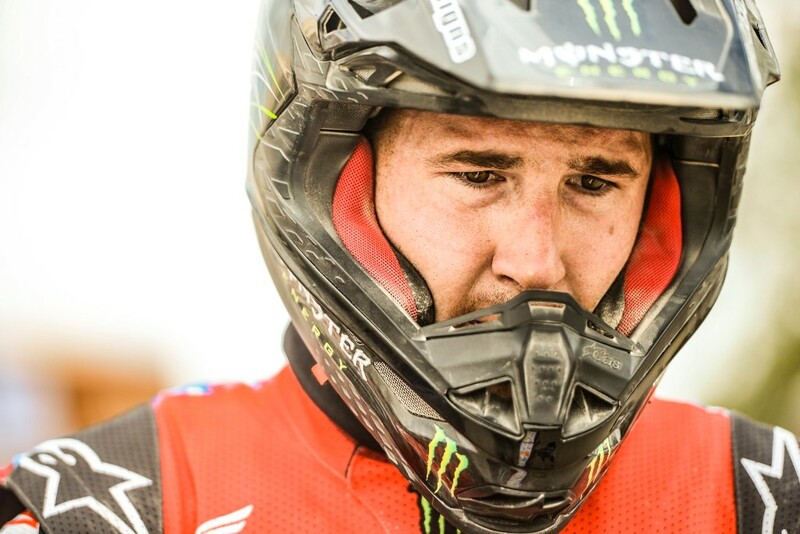 Ricky Brabec has a lot on his mind as the second half of Dakar kicks off. Can he bring Honda the victory they have been denied so many times? Photo: ©ASO; C. Lopez. That also could be a sign of a racer whose time has come. He has won the illustrious Baja 1000 and is no rookie to desert racing. It’s only that the navigation and complex rules structure of Dakar adds extra levels of difficulty. Being a Southern California native myself though I’ll certainly be pulling for him. Plus, how often do you get to cheer for Honda as the underdog? The one thing we are certain of is we are in for another 5 days of racing where absolutely anything can happen… this is Dakar after all. Laia Sanz is looking good for fastest female yet again. The Factory KTM rider had her best finish last year in 12th overall. Photo: Red Bull Content Pool. Racing in the Originals by Motul class is like subjecting yourself to torture for two weeks, but with trophies at the end. #138 Romain Leloup doesn’t seem to mind. Photo: ©ASO; F. Gooden. If you listen closely you can hear Toby Price’s mullet growing in power. Photo: Red Bull Content Pool.